Type 8905 is for analysis applications for drinking water and fresh water in industrial processes. Providing high quality water supplies is an essential service delivered by municipal authorities and utility companies around the world. Maintaining water quality requires constant monitoring and testing to ensure accurate measurements are being taken. Traditionally this has involved time-consuming calibration and maintenance. 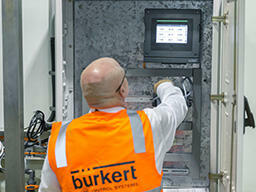 A shire council in New South Wales, Australia, however, has decided to do things differently and turned to Bürkert Fluid Control Systems for an automated precision monitoring solution that saves them time and money. The Kempsey Shire Council is a local government utility that is responsible for providing water and wastewater services to the Kempsey District, 350 km north of Sydney. At the South West Rocks recycled water treatment plant, final treatment of effluent includes ultra-filtration, UV disinfection and the addition of chlorine, all of which are required to achieve the necessary standards of water quality. To ensure that the water quality standards are being maintained, the shire council uses a monitoring station, equipped with sensors for measuring pH and chlorine. However, these sensors use reagents to establish the measurements and as an ageing system, it was becoming unreliable and required a lot of maintenance. Of greater concern was the fall-off in accuracy and the need for more frequent recalibration, which required increasing levels of operator intervention. Following the initial approach, alternative systems were also considered and compared to Bürkert’s solution. However, several benefits stood out, not least the significant improvement in accuracy and the huge reduction in maintenance. Data accuracy and the minimal drift of results is very important in establishing water quality standards and ensuring that local and federal legislation is being met. Proving the capabilities of a monitoring system in a demanding recycled water treatment plant can take time. Therefore, the treatment works decided to install three Bürkert water quality analysis systems for performance evaluation. One of the first advantages was the compact modular design of the system that makes it very flexible in terms of installation. The component parts consist of an integrated HMI display, input/output modules, sensor cubes and a cleaning system, all of which can be wall or panel mounted, and in Kempsey’s case, built into an existing cabinet. Once installed, the individual sensor modules or ‘cubes’ are essentially ‘plug and play’ on a dedicated backplane, which meant the engineers from the treatment works soon had the complete system functioning effectively. There is a simple process to set up the alarm parameters for each sensor cube, ensuring that any anomaly in the process is identified quickly. The Bürkert Online Analysis System can communicate with existing control protocols and with personnel both on and off site, ensuring that any deviation from the water quality criteria is notified immediately. This simple integration helps to reduce the time between a deviation from process parameters and the remedial action required to correct the situation. The installation at South West Rocks highlights several advantages of the Online Analysis System Type 8905 to the municipal water sector. It has a very compact footprint, making it easy to install in existing cabinets and its modular design allows each system to match the requirements of the application. The ability to maintain its accuracy without repeated calibrations has delivered tangible savings in time and money for the water treatment plant. Since the first units were implemented, Kempsey Shire Council has installed an additional system at the Fredrickton Reservoir, which is also monitoring pH and chlorine. This site endures extremely hot summers with no detrimental effects to the performance of the sensor cubes and has achieved almost a year in operation without the need to recalibrate. The performance and ease of installation of these systems has prompted several other reservoirs and water treatment plants to be equipped with the Bürkert Online Analysis System. There is a range of different sensor cubes available and in the other locations, they’ve included sensor cubes for turbidity and oxidation reduction potential (ORP/redox) to monitor particular aspects of the water on each site.